Federally qualified health centers have experienced unprecedented growth over the past decade, doubling the number of patients served to 22 million and reporting operating revenues of $14 billion in 2011. In today’s environment of health reform, this growth will climb even further, as health centers are expected to serve upwards of 40 million people in the coming years. Key to these growth efforts are lenders and investors, such as Community Development Financial Institutions (CDFIs). However, there remains a data gap about the financial and operational profile of health centers on a consistent basis that limits the financing of these crucial urban and rural anchors. To fill the information gap, Capital Link and Community Health Center Capital Fund (Capital Fund) recently completed Community Health Center Financial Perspectives, Financial and Operational Ratios and Trends, 2008-2011: A Guide for Lenders, a new resource funded by the Citi Foundation. 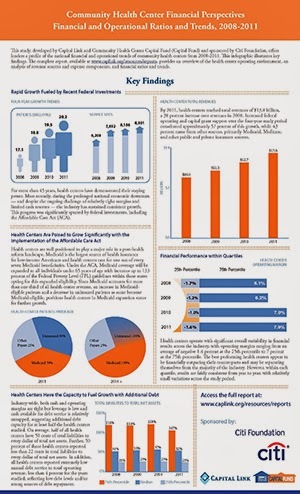 This report provides insight into multi-year financial trends for community health centers on a national basis, information that helps lenders and investors understand the industry and climate in which they operate. Using Capital Link’s database of audited financial statements from nearly 4,000 health centers and the Health Resources and Services Administration’s Uniform Data System (UDS) data, the analysis is a starting point to create more transparency in the field. The new findings provide metrics not previously available on the financial and operational performance of health centers. The Citi Foundation supported this effort to help educate the field of Community Development Finance about the financial needs and complexity of community health centers to promote financing to these vital community resources in a way that improves financial outcomes for low-income residents. Key findings are illustrated in our infographic. The complete resource document with detailed financial and operational metrics and trends is available at www.caplink.org/resources/reports. The findings were also published as part of the special report series of the Center for Community Investments, Federal Reserve Bank of San Francisco, available at www.frbsf.org/community-development/publications/special/financial-operational-ratios-trends-community-health-centers/.